Three live practices with 2x NCAA Champion Billy Donovan! 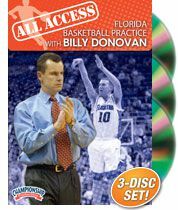 Click here to buy or view sample video | All Access Florida Basketball Practice with Billy Donovan – Basketball — Championship Productions, Inc.
Two-time NCAA Championship Coach Billy Donovan invites you to sit in on the Gators’ first three-days of practice of the 2011-12 season, a season which saw the Gators advance to the NCAA Tournament’s Elite 8. As his team prepares for the season, Coach Donovan focuses on building up their offensive and defensive styles of play. Watch as he breaks down the Spread Pick and Roll Offense along with his Motion High Offense, builds his offense and defense using a shell drill, improves his post players, and much more. This is your opportunity to see how one of the best coaches in the country runs his practices, how he coaches his players, manages practice time and uses drills – without ever leaving home! Order now! As Coach Donovan prepares his players for their first exhibition game, he does a lot of teaching and building up their style of play. He demonstrates the various offensive actions that lead into their motion high offense along with their spread pick and roll action. Donovan starts off with five man offensive drills (actions). This is a 5-on-0 situation where the team runs through the various action for each player starting with the big men in the post all the way through a pick and roll followed with a double screen. After going through their set plays and motion offense, Donovan starts to build his defensive style of play with a driving line drill that has his defense continuously working on closeouts and squaring up on the ball to contain dribble penetration. Donovan makes the transition to a 2-on-1 drill that combines getting back in transition and disrupting the fast break. He combines that drill with a 3-on-3 continuous transition drill that is competitive and focus on getting back on defense. Coach focuses the second half of practice on the offensive end. He uses Circle the Wagon Drill to train his players go up the floor and get the ball into the post to score. He wants to take advantage of his post players scoring opportunities and ability to make sure he establishes an inside presence that will lead to open shots on the perimeter. Coach Donovan finishes the first practice with a full court press attack. He emphasizes the importance of getting into the press right after a bucket is scored and to sprint back when the press is broken. Out of his pressing attack, you will gain knowledge of how to get your players to communicate and contain in the open court. Coach Donovan spends a lot of time during the second practice going 4-on-4 or 5-on-5. He runs a 4-on-4 shell defense to create competition, run offensive plays and sets, and teach his players hot to defend the screening actions they will see. 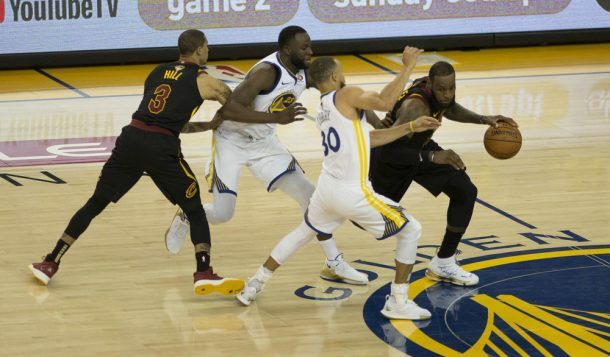 He builds his players help-side defense using a Scramble Drill that teaches his defenders to protect the basket when a defender gambles for a steal or is beat off of the dribble from the wing. Players will learn how to stunt and get back to their man while also learning how to read the offense and take a charge. In 5-on-5 situations, Donovan uses end of game transition posting to teach his players how to get the ball into the post off of a transition set or a secondary break opportunity. In this setting, the focus is on the post, but he still wants his players to understand they need to create without forcing off of the spread pick and roll offense. Coach Donovan finishes his second practice by working on the defensive end of the floor. He demonstrates the white press to help his players understand that they have to value the basketball every possession. He practices falling back into several different defensive alignments including a 2-3 zone defense and an aggressive pressuring man-to-man defense. Donovan continues to emphasize the defensive principles and values that make his team one of the best in the country. 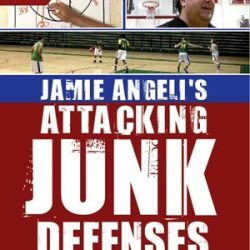 He teaches his players how to defend various offensive actions, such as the UCLA Offense and Flex Offense, and teaches them how to defend different screening actions from every angle of the floor. 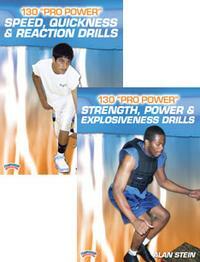 These detailed defensive lessons prepare the players for some of the offenses that they will see in the season ahead. Coach Donovan finishes his all access practice with a great set of post player/guard break down drills that fit right into his offensive tactics. He will have your guards and post players working together and on the same page with these great break down options. He ends the practice with “Circle The Wagons Live” which takes the transitions lessons and puts them in game context in a controlled scrimmage.